The Herts Moth Group assembled at Roughdown Common for their third official outing of the year. Roughdown Common is an exceedingly important site for wildlife on the doorstep of the hustle and bustle of sub-urban Hemel Hempstead. 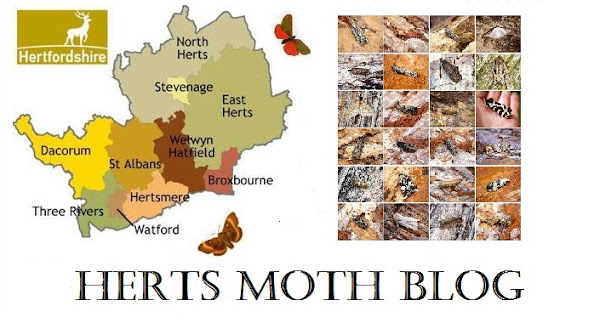 Predominantly chalk grassland with an intersecting wooded section and split right down the middle by the A41, Roughdown Common is an outstanding site for a variety of moth species. We arrived at 7.30pm, early enough to have a walk around with a net and pots and we quickly added 17 species to kick-start our list, amongst the swarms of Diamond-back moths for which we netted 2/3rds of the time there was plenty of other species to keep us interested. Species such as Eupoecilia angustana, Micropterix aruncella and Cauchas fibulella were absolutely stunning to observe. By 8.30pm the rest of the team had arrived...we would need the extra hands to set up the 11 traps! We decided to cover all areas of the reserve with traps out in the open field, some along the border of the A41 and then running through the wood and over-looking the Dell. Conditions were pretty much perfect, no wind, warm at 22 degrees and with a smattering of thin cloud which would hopefully be just enough to lock the warmth in and it was, with a comfortable 13 degrees when I left at 2am. The variety of moths was pretty astounding and despite quite possibly the slowest Spring on record things are beginning to pick up. Highlights from the traps were Small Angle Shades, Dark Sword-grass, Puss Moth, Figure of Eighty and Alabonia geoffrella, the latter typically being a day-flying moth but both of my records have been to light! I think we were a little bit early for the typical chalkland species such as Pretty Chalk Carpet and Royal Mantle, the vegetation being about 2 weeks behind the norm would suggest so. Numbers below are approximate as it really was hard trying to count them all!